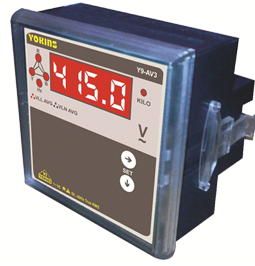 Parameter displayed : Line to Line Voltage(RY, YB & BR), Line to Neutral Voltage Phasewise, Line to Neutral Voltage Average and System Frequency. - 4 digit seven segment display. - Two switches for easy onsite programming. - Voltage displayed with Kilo indication. Inputs : Voltage (upto 500V). -	RS-485 standard, communication capability using modbus RTU protocol.